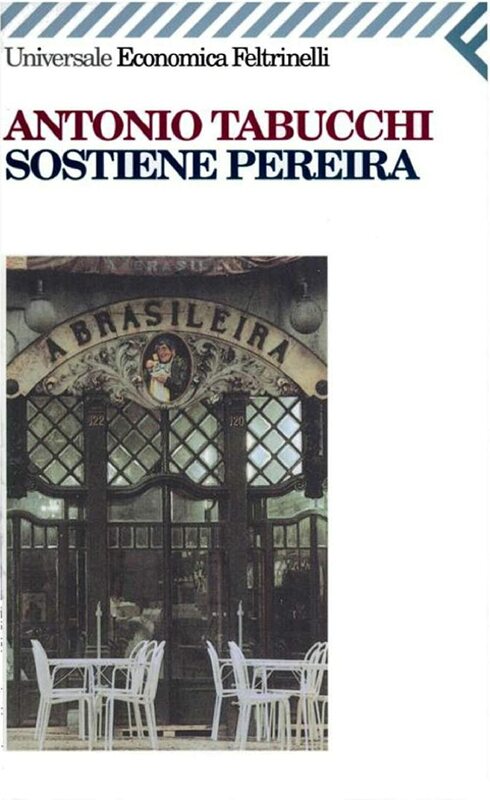 This month, I finished reading the literary novel Sostiene Pereira (Antonio Tabucchi, 1993, 214 pp). It's a suitable novel for an intermediate Italian student looking for a first novel to attempt. It's a quality piece of writing, the vocabulary isn't overwhelming, and the story is entertaining. I attend a monthly Italian conversation meetup here in Seattle, and at our last meeting I had asked for suggestions for an Italian novel to read. Previously, I had read two Italian detective novels, but I thought I was ready for something a bit more serious, and Sostiene Pereira is what the organizer proposed. Sostenere means to support, or to affirm, or to maintain, but in the context of the story, "according to Pereira" is probably the best way to translate it. The first sentence in the novel is therefore, "According to Pereira, he met him on a summer day." It quickly becomes clear that the third-person narrator is some government official writing a report to a superior. This style creates a certain tension because we expect Pereira to have serious problems, and we're not even sure if he'll survive the story. Problems aren't hard to find in fascist Portugal in 1938. Pereira is the middle-aged editor of the Cultural Page of a newspaper in Lisbon. He meets a young writer who reminds him of the son he and his late wife were never able to have. But the young man writes things that are too revolutionary to publish, and he has a girlfriend who is illegally helping the Spaniards fight Franco. Against his better judgment, Pereira does what he can to help the couple, even though the receptionist in his office seems to be working for the secret police. I thoroughly enjoyed it, and I believe it would make an excellent first novel for a strong student of Italian. 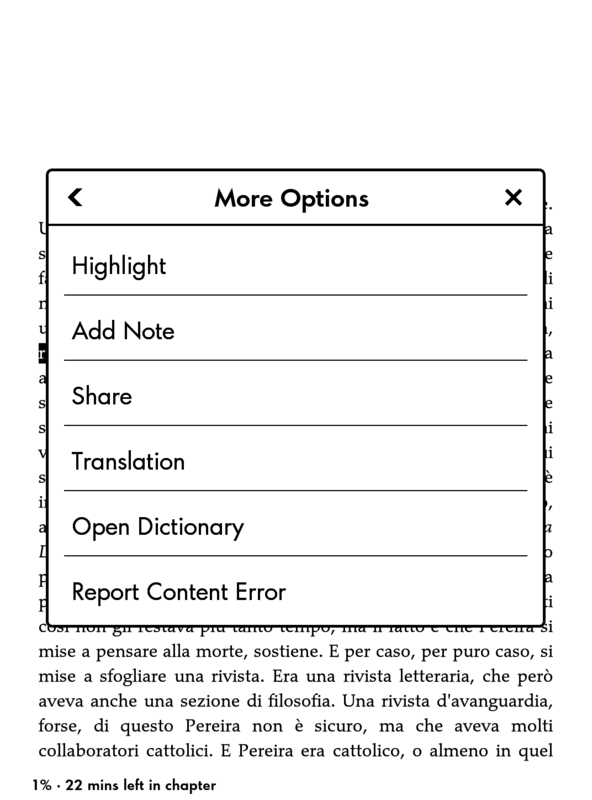 I have already described my technique for reading a foreign novel on a Kindle, but Italian presents some unique challenges--mostly involving the dictionary. 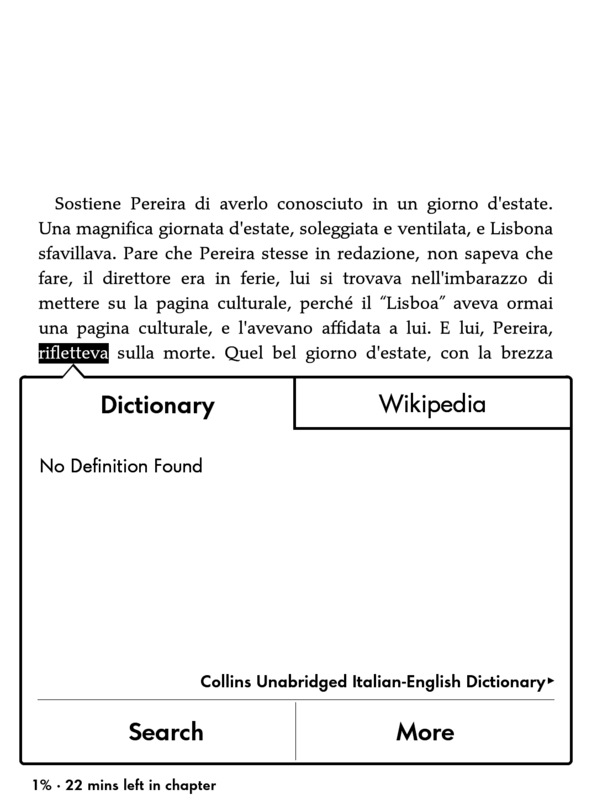 I used the Collins Italian-English bilingual dictionary, which unfortunately has some serious problems. The upshot is that although it has a good selection of headwords, it does a miserable job of finding inflected forms. 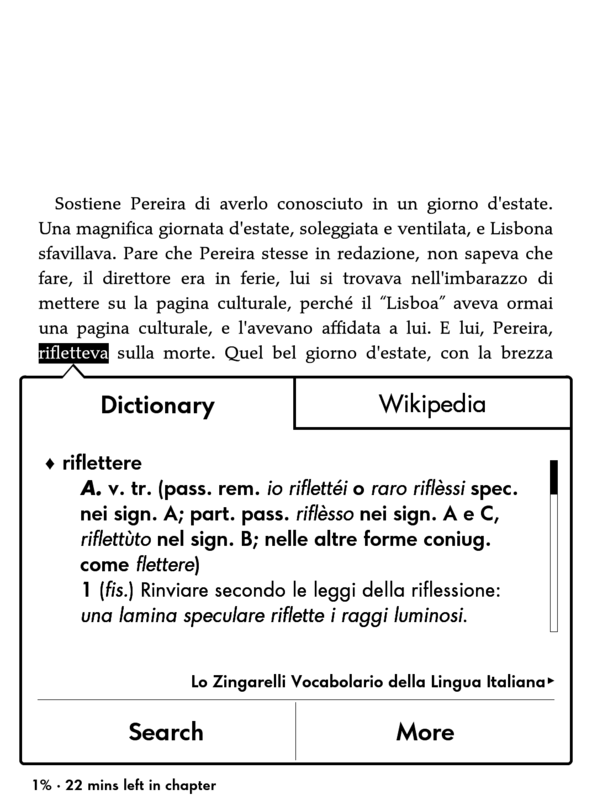 By contrast, the monolingual Zingarelli dictionary that comes with the Kindle for free has complete conjugations for all verbs. It also seems to have a good bit bigger vocabulary than the Collins. But, of course, being a monolingual, it gives Italian definitions for Italian words. I ended up using the Zingarelli as my default dictionary. 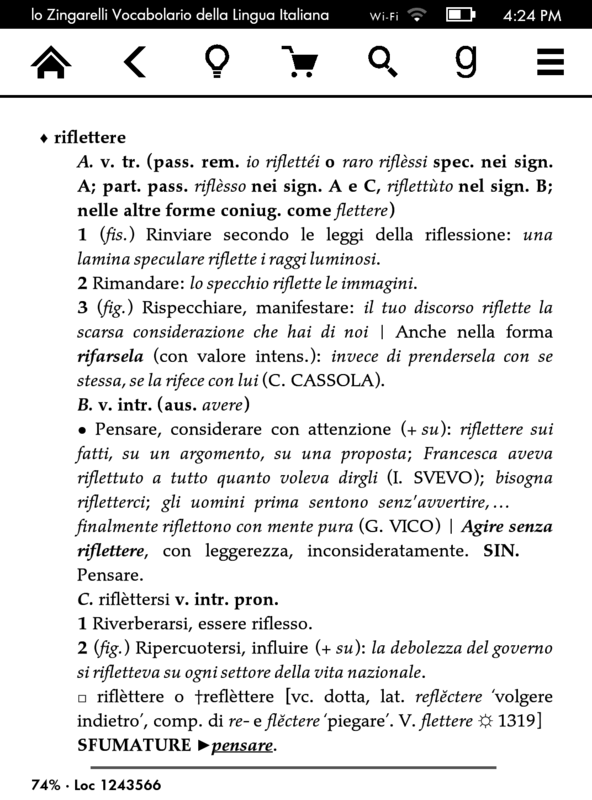 I would make a serious attempt to understand the Italian definition before giving up and switching to the bilingual. On the Kindle Voyage and Paperwhite, that's pretty easy to do. Here's an example from the first page. 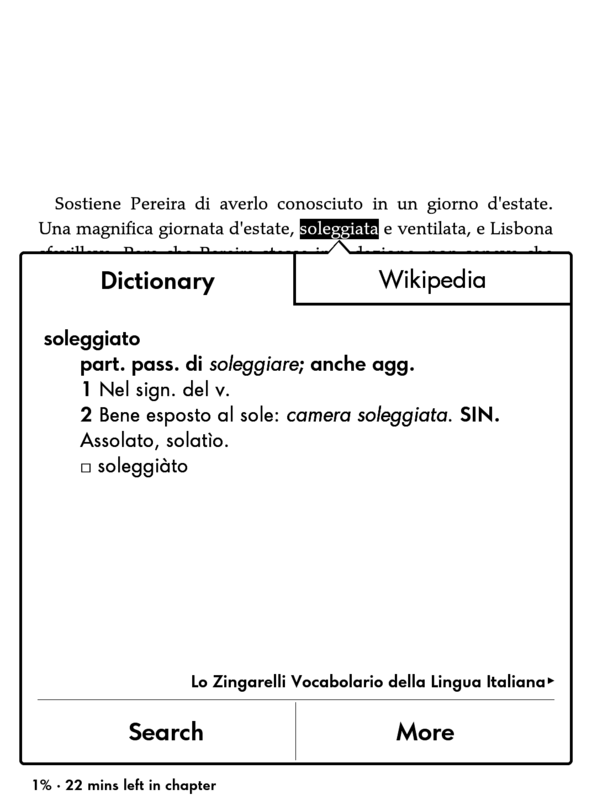 Suppose you don't know what soleggiato means. You press on it and get the following definition. 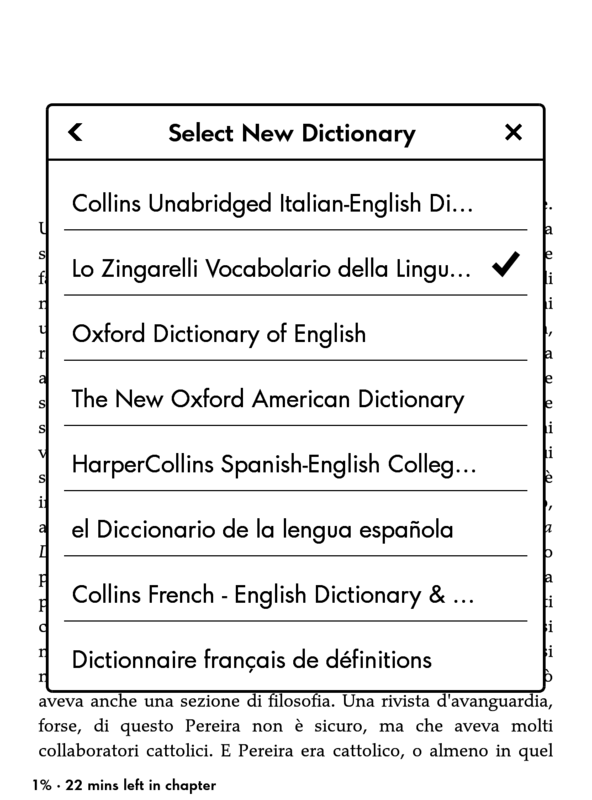 Simply click on "Collins Unabridged Italian-English" and you're in business. As expected, the word simply means "sunny." When Collins doesn't have the form, you work around the problem by opening the Zingarelli as a book and looking up the headword. For example, suppose you couldn't figure out riflettava. So switch back to the Zingarelli and click on the "More" button in the lower-right corner of the dialogue box to get the "More Options" Menu. Then tap "Open Dictionary." This opens the Zingarelli as a book. Now we can use the Collins to help us read the Italian definition. In cases like this, the first thing to try is the headword itself. 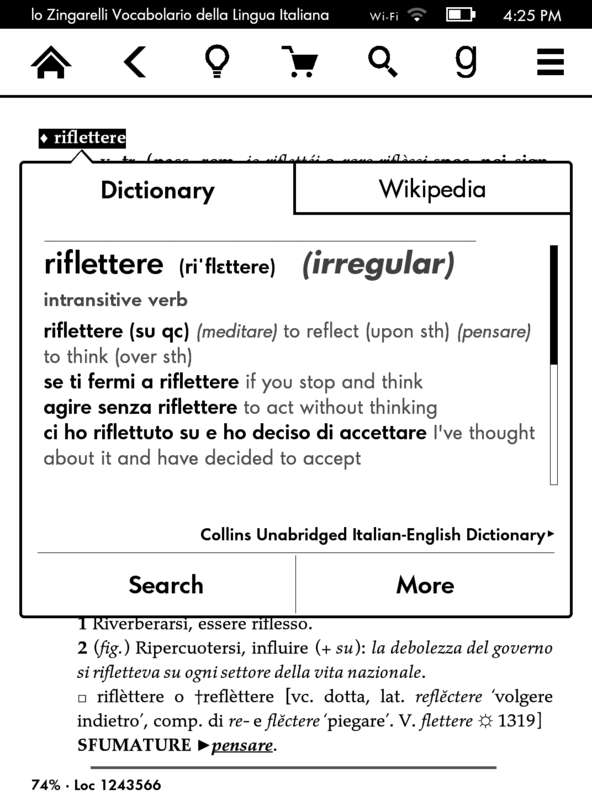 Press on riflettere and you'll see that Collins has the word after all. It just didn't have the form rifletteva. Then just tap the "back" arrow at the upper-left, and the Kindle takes you right back to the novel. I found that I was able to use the monolingual dictionary most of the time, especially toward the end of the book. A contributing factor is that authors tend to reuse the same words a lot, so if you have to look up a word at one point, you're likely to see that word again. If you made some effort to understand the monolingual definition the first time you saw it, then if you do end up looking the same word up again, the monolingual definition alone will usually jog your memory. That's a very good thing, because the more you spend immersed in Italian, the faster you'll learn. I followed most of my own advice for learning a language by reading, and created flash cards for most of the words I had to look up. As a result, I learned about 100 new words in the course of the book. Perhaps I'm getting better at Italian, but I found Sostiene Pereira an easier read than the two detective stories. Both of those contained at least a few sentences that I never managed to figure out, but I feel I understood every word in Sostiene Pereira. According to me, that's very satisfying.